A Start Space is a kind of space that appears in a number of games in the Mario franchise. They first appear in the game Super Mario Bros. 3, where they are referred to as Start Panels. Here, they are white squares with the word START on them. They appear at the beginning of each World. Mario and Luigi start on them, and get thrown back to the start place when they die in the first level of the game, or get a Game Over. Sometimes, mini-game markers appear on the Start Space, as it is possible of all other spaces on Super Mario Bros. 3 maps. In Super Mario World, Yoshi's House could be considered a Start Space of sorts, as Mario begins here. Start Pads return in New Super Mario Bros., where they serve as the start of each world as well, but are now black circles with red arrows. In New Super Mario Bros. Wii and New Super Mario Bros. 2, however, Start Spaces are white rather than black. The Start Space as seen in Mario Party 4. Here, there is a lottery going on. On Mario Party boards, Start Spaces is where the players start at the beginning of a game. Here, the player determine their starting order by hitting a Dice Block and start to play. When players pass the Start Space in Mario Party, Koopa Troopa will give them 10 coins. Several events during the game are hosted on the Start Space, such as the Last Five Turns Event in Mario Party 2, Mario Party 3, and Mario Party 4, and Bowser Time in Mario Party 7. Several events also throw players back to the Start Space. 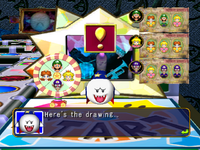 The Start Space does, however, not behave as a regular space on Mario Party boards, as they cannot be reached after the players have left them, unless they are thrown back by an item or an event. This page was last edited on October 21, 2018, at 19:12.